Published by Midwest Directory Publishing Company, 1929. Cover has light wear. Inside pages are nice and clean. 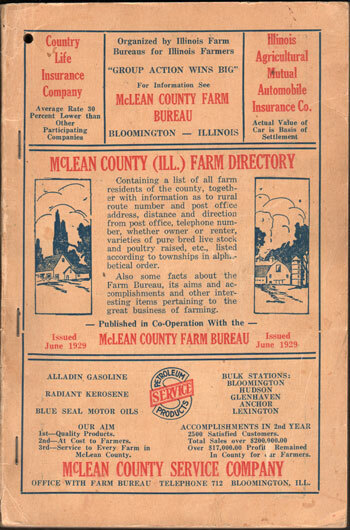 A directory of the farm residents of McLean County, Illinois. Includes name and address. Soft cover, 152 pages. Also includes numerous business ads. We will ship your order within 24 hours of receiving your payment (on first business day if received on weekend or holiday.) Shipping cost is only $1.95 for the first book or CD/DVD and only 25 cents shipping for each additional book or CD/DVD purchased.